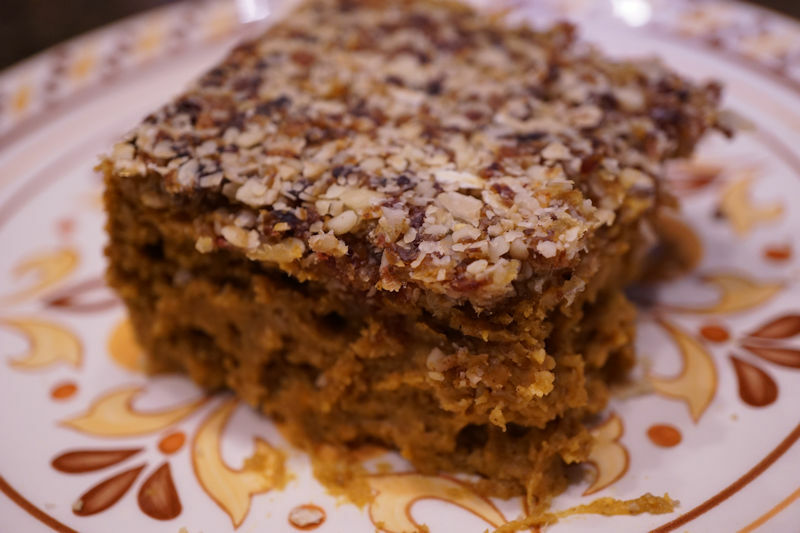 I've been in the kitchen working on creative ways to use pumpkin for the holidays. 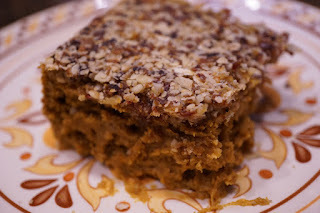 This pumpkin dessert is low in sugar and oil free but still super yummy! Process the walnuts, dates, 1/2 cup of rolled oats, and raisins until ground down and sticky. Press into an 8x8 square pan lined in parchment paper (with paper hanging over the edges so you can lift out the bars when they're cooled. In a medium sized bowl, add the wheat flour, oat flour, 1/4 cup oats, baking powder, salt, pumpkin pie spice, coconut sugar, and stevia powder. Mix well. Add in the pumpkin and non-dairy milk and stir well. It sill be a thick mixture. Transfer the mixture on top of the layer you just pressed into the pan. Bake for 30 minutes. Let cool completely. Cover with plastic wrap and chill for at least 2 hours in the refrigerator. Just before serving, remove the bars from the pan by lifting the parchment paper out of the pan. Cut into pieces and then flip them over to serve. The crust will now be on top! This looks good I may have to give this one a try! Having our Nutritarian holiday class next week, think I will try these. Is that a 15 oz can of pumpkin? It is a 15-oz can. I will update the recipe. Thanks for asking! If you want the pie bars to be sweeter, use the stevia powder. Could I use all oat flour? Asking these for a celiac so the wheat flour is a no-go! I would use GF flour, not more of the oat flour. The texture would not be correct.